Over the years, the travel industry proactively strived to improve their services to enhance customer experience. This is because of the never ending challenge the industry is facing – to stay ahead of the competition and to offer something new to excite the customers. In order to meet these demands, the industry modernized their facilities and services. If you compare the industry today from how it was before, you’ll distinctly see the difference and see how much has changed. There are a lot of transactions that took a lot of time before, which are now done faster and easier. At present, the prime group that are traveling the most are the millennials. Although person-to-person interaction is still important for them, these people prefer to make their bookings and to do other transactions online. Because of that, it becomes a necessity for travel agencies to hire certified Fiber Optic technicians to set up high quality fiber Internet. With fast and reliable Internet, travel agencies can perform online transactions with ease. Along with the modernization of the travel industry, there are emerging digital trends that aims to optimize overall customer experience. This technology revolutionized the gaming industry and it has the capability to revolutionize the travel industry, as well. Although, there are already some travel agencies that are utilizing the capabilities of virtual reality, it still has the potential to do so much more for the industry. The ability of VR to simulate artificial experiences and stimulate a person’s senses could really come in handy for the travel industry. With a virtual reality headset at hand and a 360 video, customers could have a preview of the experience they could have at a certain travel destination to help them in their decision-making. While virtual reality has the capability to digitally create a whole new environment, augmented reality could add things to real-life surroundings. Many augmented realities could be experienced through smartphones and tablets. This technology clearly has the capacity to enhance customer’s travel experience. With the aid of augmented reality, customers could easily get information about a destination’s history through their phones and tablets in a modernized manner. Many services that used to require tedious work are now made convenient through automation. Automated services have helped many businesses to make their transactions easier and faster. 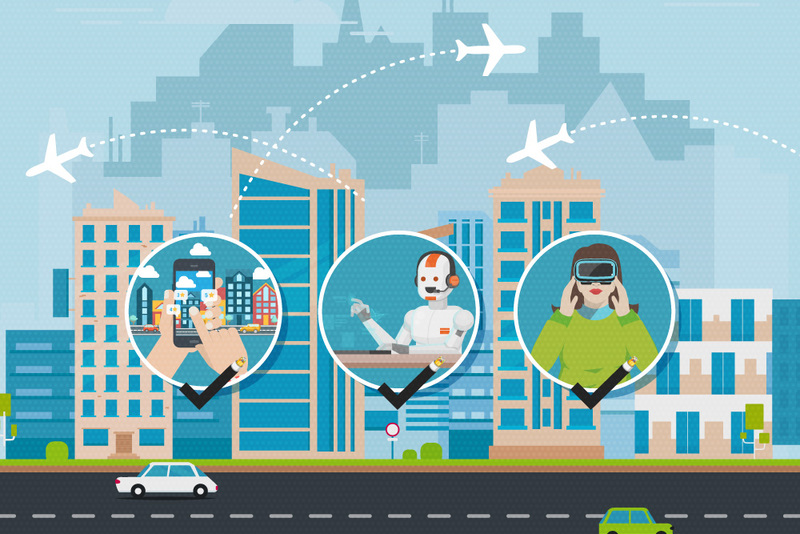 In the travel industry, artificial intelligence is utilized to enhance customer service. Some travel agencies optimize their responsiveness to their customers’ messages and inquiries with the help of chatbots. This technology is designed to enable businesses to promptly respond to simple queries at any time of the day, thus, enhancing customer experience. Together with the evolution of digital technology is the evolution of the travel industry. One thing is for sure – the capacity of these existing digital trends to optimize the overall customer experience hasn’t reached its dead end yet. These technologies still have the potential to improve the industry for the coming years.